As technology progresses, so does OHAUS lab equipment. Users can expect to use color displays, touchscreens, hands-free technology, and computers with the technology integrated into OHAUS lab equipment. USB and RS232 connectivity is standard with many OHAUS devices – as users develop more advanced techniques and approaches, their lab equipment should also. The OHAUS MB23 Moisture Analyzer provides precise moisture content determination at an unbeatable value. With a large backlit LCD display, standard RS232 port, 110g capacity with a readability of 0.01g/0.1% and an non-glass infrared heating element, the OHAUS MB23 Moisture Analyzer offers moisture analysis for any budget. 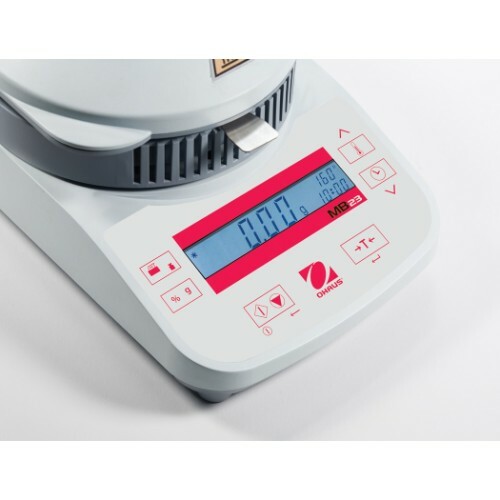 OHAUS MB23 Moisture Analyzers are very easy-to-clean to ensure the integrity of your samples and the compact design allows them to fit seamlessly into most workspaces. The new OHAUS MB27 Basic Moisture Analyzer combines high quality and durable construction into a sleek, compact design. The OHAUS MB27 offers dependable, accurate results for a wide variety of moisture analysis applications. The compact footprint (17x14x28cm) of the OHAUS MB27 is designed to take up less space. The easy-to-clean heating chamber is ideal for frequent use and inexpensive maintenance. Ohaus MB90 Moisture Analyzers combine speed and precision in one moisture analyzer, allowing you to test more samples in less time. Measuring moisture content has never been easier than with the Ohaus MB90 Moisture Analyzers. 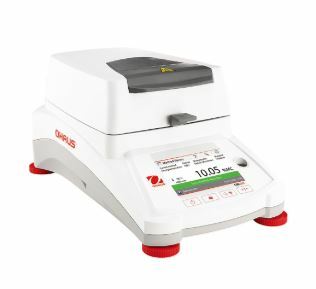 The Ohaus MB90 Moisture Analyzers’ halogen heating system distributes heat uniformly over the sample to be analyzed and speeds up the drying process for users. This allows the MB90 Moisture Analyzer from Ohaus to deliver fast and precise moisture measurements, saving time and improving efficiency in any lab. 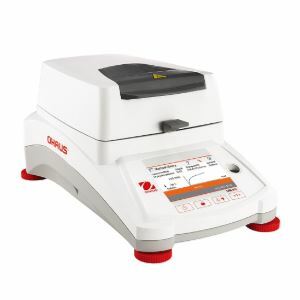 This Ohaus MB90 Moisture Analyzers’s precisely controlled halogen heating system that dries samples quickly and ensures uniform heating, allows the system to yield fast, precise and repeatable results of 0.01% readability. This precision gives users reliability and confidence in their results while taking up less valuable time spent carrying out measurements. The OHAUS MB120 Moisture Analyzers deliver functionality and precision that can be relied on over and over again. The OHAUS MB120 Moisture Analyzers are easy to operate and clean – this means that users can test more samples in less time than ever before! 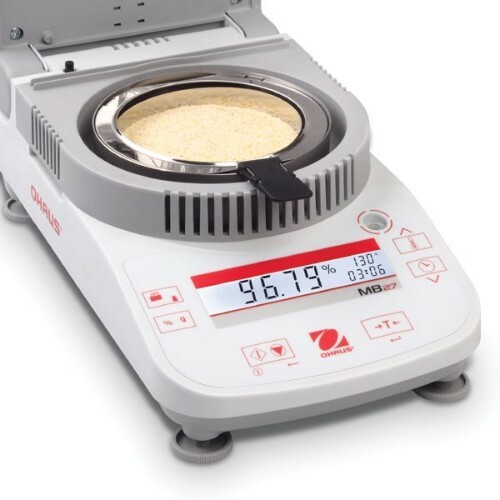 The advanced features of the OHAUS MB120 Moisture Analyzers, such as the temperature guide, help to analyze the optimum drying temperature while methods and results storage allows for statistical analysis of measurements. This provides users with a much greater overall management suite. The three levels of user management with the OHAUS MB120 Moisture Analyzers also ensure data safety – set up and lock temperature settings and method parameters with secure and personalized administrator access.